Cruiser Safaris safari hunting Terms of Business. Below are our hunting conditions and terms of business for safari hunting in the Limpopo Province of South Africa with Cruiser Safaris. These safari hunting terms and conditions are designed to protect both ourselves and you as a potential hunting client from any misunderstandings. The safari hunting terms and conditions listed here include deposit and cancellation information, general terms of business and our Liability policy. A deposit of 50% of the Daily Rates is required to confirm a booking. The balance is not due until the end of your safaris. A personal check can be used for your deposit, however the final payment in south Africa must be made in cash, Visa or Mastercard. In the event of a Safari cancellation, the deposit is not refundable unless cancellation of the booking is received 120 days prior to the start of the booking, in which case the deposit will be refunded less a 50% administrative fee. Bookings can be re-scheduled, depending on availability for the current year only. No refunds for either a late arrival or an early departure. As a bonus to our clients, we do not charge daily rates for your day of arrival or day of departure, unlike a lot of other hunting outfitters. Cruiser Safaris realize that your flight to Africa is a long one, and by the time you reach our camp you are probably exhausted and would just like to relax for awhile by our pool or simply take in the atmosphere and settle in. Your day of departure can also be hectic with packing and the drive back to Johannesburg. You can begin your safari relaxed and depart refreshed. We know some of you will see some of the game animals on the drive to our camp and want to begin your hunting immediately on arrival. For those who wish to hunt the day of their arrival or their day of departure we will only charge 1/2 of our daily rate. Trophy Fees are applicable to all animals actually bagged or wounded and lost and are due at the end of the Safari. All payments made in South Africa must be cash, Visa or Mastercard. A standard Safari is a minimum stay of 7 days. Hunting is only permitted when in the company of a PH. Cruiser Safari reserves the right to change prices or terms herein without prior notice. 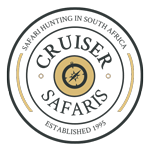 While Cruiser Safaris takes the utmost care to ensure the safety of our hunting client guests and their belongings, we take no responsibility for any loss, injury, accident, mishap, illness, disability or death before, during or after the safari period. We recommend clients take out baggage, travel, trip cancellation and medical evacuation insurance before they travel. 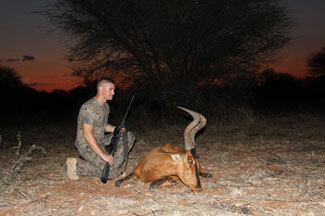 All clients will be required to sign an indemnity statement prior to the commencement of any safari or hunting. Cruiser Safaris, the company, all staff, subagents and personnel associated directly or indirectly with the company are not liable under any circumstances for misfortunes or claims which may occur during the course of a hunting safari and or any business pertaining to the company. We often recommend third parties for travel, accommodations, and / or other services directly or indirectly related to the safari, this is all done and recommended in good faith. We don't accept any liability or claims against Cruiser Safaris and or their staff or representatives worldwide under any circumstances. If you have any questions on any of the above terms and conditions for safari hunting with Cruiser Safaris in the Limpopo Province of South Africa, please don't hesitate to Contact Us. Also see our Daily Rates page for information regarding what is and is not included in our rates.